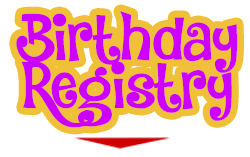 We are pleased to offer our Birthday Registry to help your special one have a fun filled birthday. Bring them in (or do it on their behalf) and let them pick out all the gifts they would like to receive for their birthday. This eliminates the hassle of getting duplicates or trying to give friends and family gift ideas. All items purchased from the registry are discounted 10%. Gifts can be ordered over the phone (716-609-2002) or via email at bloomsburylanetoyshoppe@gmail.com. We can have the gift wrapped (complimentary!) and ready for pick-up or delivered (for a nominal fee). We aim to make your gift giving as enjoyable as possible!